The Creme-De-La-Crust: Does Waterloo's Crust Bros Live Up To Its Name? Added on 10 October 2018 . By Olivia Cheves. I’d be lying if I said this was my first visit to Crust Bros. I’d be lying if I said this was even my fifth. I’ve been a regular diner at the Waterloo pizza spot since it floated into my periphery last summer. Not only does it offer some of the finest fix-your-own slices this side of the river, it’s also the only thing keeping my relationship with my sister alive since we moved to opposite sides of the city. So I’ve brought her along tonight because sometimes it’s nice to show your emergency contact that you care. Sandwiched between a betting shop and the rosy glow of Tonight Josephine, Crust Bros chipboard interiors are filled wall-to-exposed-brick-wall when we rock up on a Thursday evening with a happy mash of post-work and pre-theatre diners. The kitchen is a-buzz with activity as chefs slide pizza paddles in and out of the mustachioed oven at a rate of knots. They walk the walk, but can these crusts talk the talk? While this is by no means our first rodeo, there are a few new additions to the Crust Bros dynamic since our last visit. Firstly, they’ve added a range of house cocktails to their drinks menu. The signature Negroni (£6.95) makes for an easy choice for yours truly as your standard gin, campari and martini rosso mix gets an extra aromatic lift from the inclusion of bay leaf bitters. Secondly, while the Crust Bros £5 takeaway special has long been a staple of the restaurant, they’ve now introduced a dine-in taste of the day. Mixing scarmorza, mozzarella, Mortadella ham and a pistachio base, today’s £10 evening special is a turn up for the books. Vibrant in colour and taste, the smokey scarmorza and lightly salted ham adds depth to the sublimely creamy and surprisingly light pistachio sauce. I manage to nick a slice of the Cheeky Bro (£8.95) off my sister’s plate, getting an oversized mouthful of juicy guanciale and spring onion on the first bite, followed by more of that smoky scamorza and rich red sauce in the second. She looks a bit miffed until I remind her she might need a kidney off me one day. 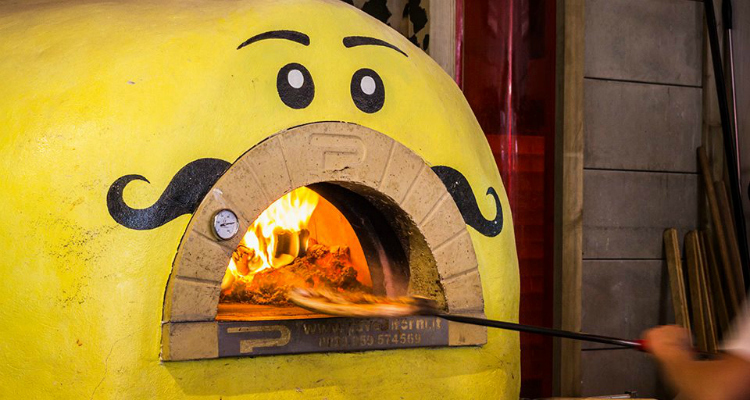 All the pizzas are cooked inside this fine mustachioed pizza oven. Tasty toppings and maverick sauce combinations aside, as the name would suggest, it’s the crusts here that are really something else. Soft and chewy with a charred dapple, the very sight of them forming a bubbly buffer around the base is enough to send my salivary glands into deluge, and I’d thoroughly recommend having a pot or two of their sriracha mayo (£1) on hand for optimum dunking conditions. Alongside their completely customisable pizzas, Crust Bros also offer build-your-own gelato (from £5.95) as a dessert option. After picking almost at random from the menu, we’re served up a towering edifice of icy raspberry and passion fruit gelato, fresh strawberries and a sweet berry mascarpone that tastes exactly like a frozen Petit Filous. 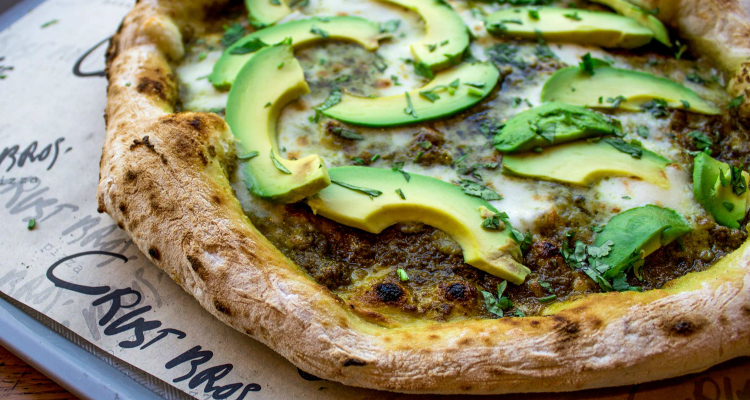 For some of the most enticing toppings in the biz, Crust Bros is a must-visit. Trying to stand out as a pizza restaurant in London is no mean feat. 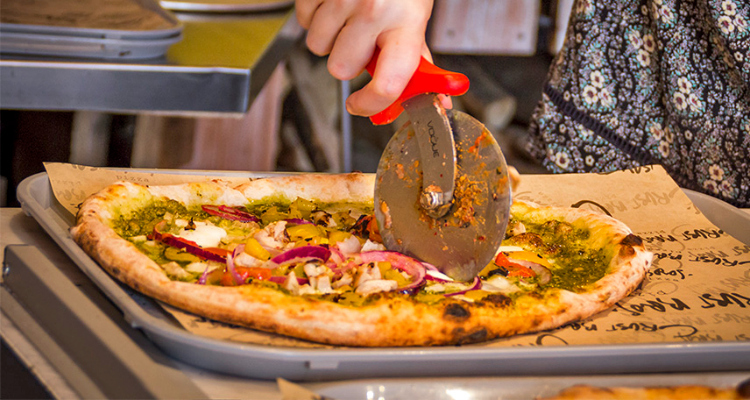 Some impress with their style, others with the size of their slices, and some prefer to just sit back and let the goods do the talking. With one of Waterloo’s most relaxed atmospheres, swift service and some of the most mouthwatering pizzas in the south, Crust Bros are Kings of the latter camp.